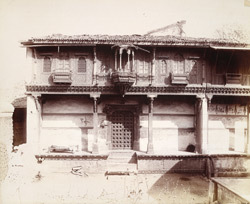 Photograph of the façade of the haveli, said to be Bharot's House at Patan, Gujarat, taken by Henry Cousens in the 1880s. Wood carving on house facades was prevalent in Gujarat. The decoration is generally concentrated on the upper storey, with the ground floor left relatively plain. In the 'Archaeological Survey of Western India, IX', Cousens and Burgess described these wooden houses: "At Patan many beautiful specimens of this work may still be found, particularly in the houses of the late Bharot Kahanji Umad-singhji in Khada Khotadi's Mahalla, and of a Vaniya in another quarter of the town."